The Sunday bird walk went to West Buttertubs Marsh in Nanaimo. The morning was cloudy and warm. A very special thanks to Eric Demers and the banders of the Vancouver Island University for a very informative demonstration of bird banding this morning. at the West Buttertubs Marsh area in Nanaimo. Band-tailed Pigeon, Eurasian-collared Dove, Downy Woodpecker, Anna’s Hummingbird, Common Raven, Yellow Warbler, Common Yellowthroat, MacGillivray’s Warbler, Orange-crowned Warbler, Warbling Vireo, Willow Flycatcher, Chestnut-backed Chickadee, Marsh Wren, Bewick’s Wren, Bushtit, American Robin, Spotted Towhee, Song Sparrow and House Finch. 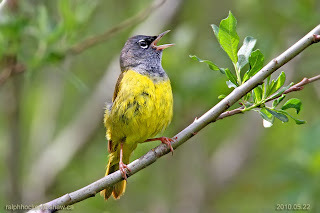 MacGillivray’s Warbler: Ralph Hocken Photo. A Black and White Warbler was seen not far from the bridge at French Creek. A Ruddy Turnstone was seen with Black Turnstones, Black-bellied Plovers and Gulls in the incoming tide at the Columbia Beach gravel bars near the pond. Canada Geese, Mallard, Northern Pintail, Common Merganser, Common Loon, Red-necked Grebe, great Blue Heron, Bald Eagle, Killdeer, Black Oystercatchers, Greater Yellowlegs, Western Sandpiper, Least Sandpiper, Long-billed Dowitcher, California Gull, Glaucous-winged Gull, Pigeon Guillemot, Marbled Murrelet, Band-tailed Pigeon, Eurasian Collared Dove, Anna’s Hummingbird, Belted Kingfisher, Northern Flicker, Western Wood-pewee, Willow Flycatcher, Northwestern Crow, Common Raven, Purple Martin, Chestnut-backed Chickadee, Red-breasted Nuthatch, European Starling, Cedar Waxwing, Yellow Warbler, Song Sparrow, Red-winged Blackbird, Purple Finch, House Finch, Pine Siskin and American Goldfinch, were all seen and heard at the Englishman River Estuary in Parksville. Two Great Blue Heron, eight American Goldfinch, forty Long-billed Dowitchers, one Short-billed Dowitcher, sixty Western and Least Sandpipers, six Mallards, five Common Ravens, ten Northwestern Crows, over one thousand European Starlings, five House Finch, four Turkey Vultures, over thirty Violet-green Swallows, two Song Sparrows, two Northern Shoveler’s, eleven Green winged Teal, Three Savannah Sparrows, lots of Glaucous-winged Gulls, a flock of Canada Geese, several Northern Rough-winged Swallows, twenty-four Common Mergansers and American Robins were seen at the Holden Creek Estuary in south Nanaimo. Nanoose Naturalists will begin their fall sessions of meetings at 7pm at the Nanoose Library Hall. Our first speaker will be Crystal McMillan of Bear Smart BC to talk about Bears and People in BC. 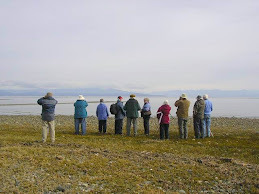 The Tuesday bird walk will be going to the Plummer Road side of the Englishman River Estuary in Parksville. Meet at the parking lot near the Lion’s Club Playground at the Parksville Beach Community Centre at 9:00 a m. or at the corner of Plummer Road and Shorewood Drive at about 9:10 a.m. The Sunday Bird Walk on Sunday September 01, 2013 has been cancelled! The Sunday Bird Walk on Sunday September 08 will be going to Neck Point Park in Nanaimo. We will meet at the Birdstore at 9:00 a.m. or at the parking lot at Neck Point Park off Hammond Bay Road at about 9:15 a.m.
A Ruddy Turnstone was seen with Black Turnstones and Gulls at the incoming tide at Columbia Beach gravel Bars near the pond. on August 22. The Sunday bird walk went to Beck Creek in south Nanaimo. The morning was cloudy and warm. A flock of Bushtits were spotted as they moved from bush to bush, singing as they flew. A mixed flock of Western and Least Sandpipers flew into in clouds back and forth along the shore giving us great looks. Purple Martins flew low over their nesting boxes, singing all the while. We saw a large flock of Barn Swallows perched on a thin snag on the estuary. 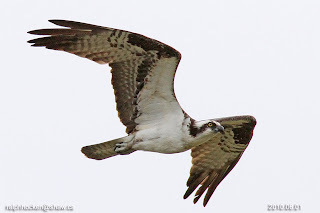 An Osprey flew high over Beck Creek with prey in it’s talons. Glaucous-winged Gull, Band-tailed Pigeon, Eurasian-collared Dove, Belted Kingfisher, Killdeer, Western Sandpiper, Least Sandpiper, Northern Flicker, Downy Woodpecker, Northwestern Crow, Common Raven, Purple Martin, Barn Swallow, Chestnut-backed Chickadee, Red-breasted Nuthatch, Bewick's Wren, Bushtit, Song Sparrow and House Finch. Three Barred Owls were seen in a backyard that backs on to Departure Creek in the1800 block of Deerborne Place in Nanaimo. 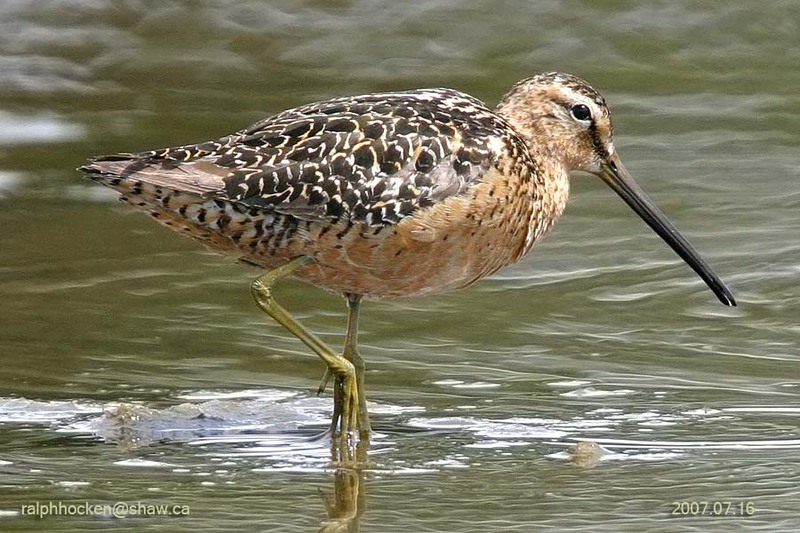 Twenty-two Long-billed Dowitchers were seen at the mud flats on the Plummer Road side of the Englishman River Estuary in Parksville. A Merlin was spotted at the same time in the same area. Bewick's Wren, Glaucous-winged Gull, California Gull, Bonaparte's Gull, Black Turnstone, Black-bellied Plover, Killdeer, Northwestern Crow, Bald Eagle, Eurasian Collared-Dove and Double-crested Cormorant were seen at Columbia Beach. Purple Martin, Song Sparrow, Belted Kingfisher, Savannah Sparrow, Turkey Vulture and Rock Pigeons were seen at French Creek. Least Sandpipers, Western Sandpipers, Semipalmated Sandpipers and two Baird's Sandpipers were seen on the mud flats on the Plummer Road side of the Englishman Estuary in Parksville. 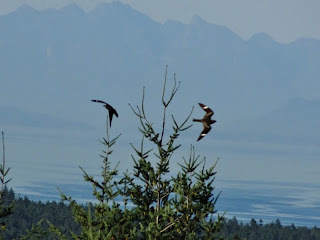 Black Oystercatchers, Brewer's Blackbirds, House Sparrows, European Starlings, Great Blue Herons, Black Swifts, Red-tailed Hawk, Barn Swallows, American Robins, Pileated Woodpecker, and Northern Flickers were seen at Qualicum Beach. 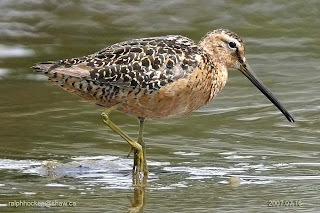 The Sunday bird walk on August 25, will be going to the west Buttertubs Marsh in Nanaimo. 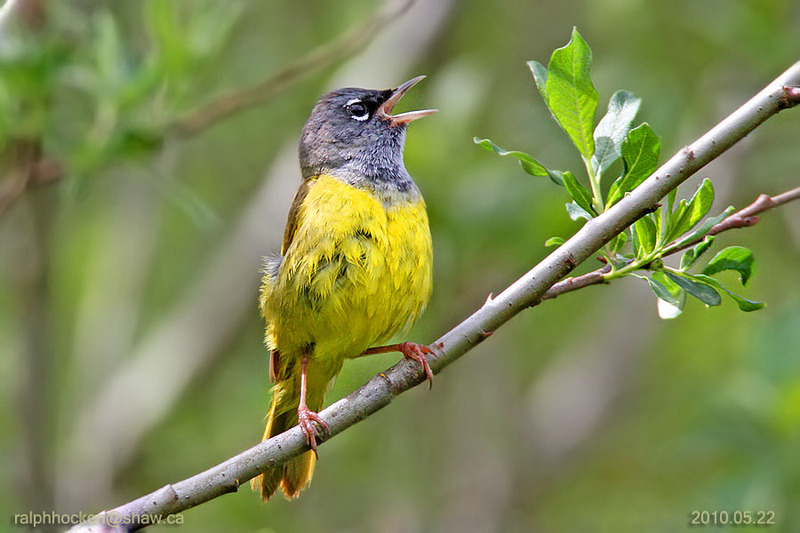 We will meet at the birdstore at 9:00 am or at the Buttertubs Marsh parking lot off Jingle Pot Road at about 9:15 AM. Please note the different location for the start of the walk. The Sunday bird walk went to Linley Valley in Nanaimo. The morning was cloudy with light rain showers. 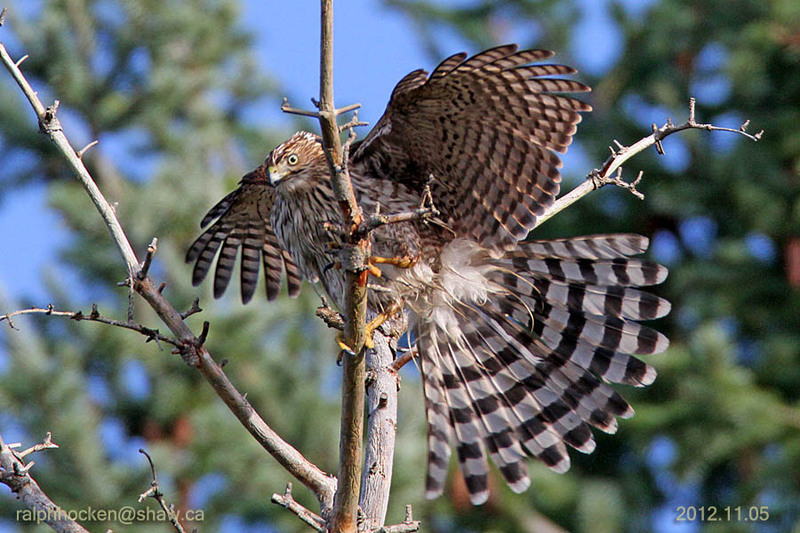 We spotted a Cooper’s Hawk being mobbed by Purple Martins and a Black Swift. A family of Song Sparrows entertained us with their songs. Canada Geese, Mallard, Wood Duck, Pied-billed Grebe, Turkey Vulture, Cooper’s Hawk, Glaucous-winged Gull, Anna’s Hummingbird, Pileated Woodpecker, Northern Flicker, Band-tailed Pigeon, Common Raven, Northwestern Crow, Black Swift, Purple Martin, American Robin, Chestnut-backed Chickadee, Red-breasted Nuthatch, Western Tanager, Spotted Towhee and Song Sparrow. Cooper’s Hawk: Ralph Hocken Photo. Nine Common Nighthawks were seen over Pipers Lagoon in Nanaimo. Three Bald Eagles have fledged from their nest at Pipers Lagoon. Common Nighthawks: Steen Petersen Photo. The Sunday Bird Walk on August 18 will be going to Beck Creek in south Nanaimo. 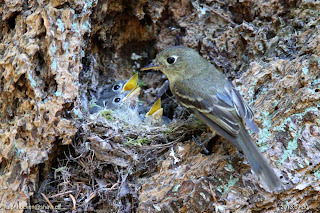 We will meet at the bird store at 9:00 a.m. or at about 9:30 am near the entrance to the Living Forest Campground on Maki Road off Highway one. The Sunday bird walk went to Bowen Park in Nanaimo The morning was sunny and warm but cool in the forest. 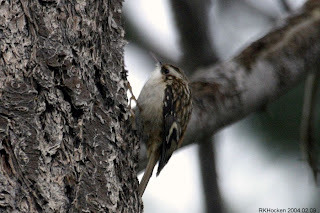 Among the highlights was the sighting of several Brown Creepers throughout the morning. 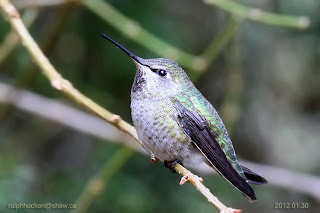 We saw over six Anna’s Hummingbirds and one Rufous Hummingbird playing tag in the field near the Rhodo Bushes. Mallard, Bald Eagle, Eurasian Collared Dove, Rock Pigeon, Glaucous-wing Gull, Rufous Hummingbird, Anna’s Hummingbird, Northern Flicker, Northwestern Crow, Common Raven, Chestnut-backed Chickadee, Red-breasted Nuthatch, Black Swift, California Quail, Bushtits, Golden-crowned Kinglets, Brown Creeper, Pacific Wren, Bewick's Wren, Dark-eyed Junco, American Robin, Cedar Waxwing, Spotted Towhee and Song Sparrow. A flock of Red Crossbills was seen feeding at a cedar log at Lantzville Beach. A pair of Red Crossbills was seen in a garden along the Little-Qualicum River north of Qualicum beach. Over one hundred Common Nighthawks were seen over Wren Place and Woodthrush Place in Nanaimo. The Sunday Bird Walk on August 11 will be going to Linley Valley in Nanaimo. We will meet at the bird store at 9:00 a.m. or at about 9:20 am at the end of Burma Road off Lost Lake Road.